At the last School Board meeting several speakers, including Board member Ann Wasson, shamed and bad mouthed Gary Glass who sat quietly as the abuse was heaped on him. This came after the obligatory caution from Chair Nancy Nilsen about how “civility” would be demanded at the meeting. But after the meeting got under way Chair Nilsen made no attempt to remind speakers that personally abusing a school board member was verboten. Tim Grover, my old friend and now foe, apologized for this rank behavior privately to the wife of a former School Board member who had attended the meeting. This woman has a particular interest in the Red Plan right now because her home is being taken through the eminent domain process which the District hid from view during last year’s school board elections. She opposes the Red Plan. She must hate children too. Despite a pretty disorganized effort to promote our spaghetti fundraiser we served over 200 meals last Saturday and collected a profit of over $1,200. We have a little sauce left over so we froze it and will serve it up again at tomorrow’s LDV (Let Duluth Vote) meeting. Feel free to join us. After the story showing a “whopping” majority of Chamber attendees after a debate on the upcoming levy were in favor of it the Chamber had an online poll of its members. 15% bothered to respond. Of those half or about 7.6% of the total Chamber membership were in favor of the second highest tier which would increase taxes. The Trib writes about the results here. I painted up a couple of signs for our Spaghetti Dinner on Saturday. One will go up at my house for the 21,000 cars that travel past it daily. I’d like another good place for the other. This is a photo of the East High School Teacher’s lounge taken last week. Evidently lawnsigns are being passed out there in favor of the levy. Recently the Teacher’s Union President (Who refused to support an operational levy in 1997) sent out an email out to all teachers on school computers telling them to vote for the levy. While this certainly violates the law which limits the District to providing information about the levy and forbids spending public tax dollars on advocacy its hard not to sympathize with the teachers. Many, if not most of them, are as unhappy about the Red Plan as the rest of the community. But its their heads Dr. Dixon is talking about putting a bullet in if the levy fails. And I hear he’s saying very mean things about Gary Glass and me when he goes to PTA meetings. Hey, its his gun that’s smoking. Can you imagine this in Russia? I found this video of McCain at the recent Al Smith dinner on a blog with the headline “The McCain we used to love.” I take the point but as a former McCainiac I had a different thought – wouldn’t it be great if the rivals in democratic elections all across the world could set aside their rivalry like this on the eve of an election? About that special meeting this week. No agenda was announced for it and there was a pretty big item on it – the approval of the health insurance plan with Health Partners. Usually, all contracts are discussed at the business committee meeting prior to the School Board meeting especially contracts as big as the insurance plan. But there was no information provided at the special meeting. There were no cost estimates! Gary Glass deduced that the increase in costs might be on the order of $1,200 per employee times 1500 employees. About all he knew was that the new expense would be an increase of 15%.That would be close to a $2 million premium increase. The Board suspended its rules to pass the contract on a six to zip vote with little discussion and no information! Gary was the zip. He had previously voted against suspending the rules which allowed the Board to authorize a contract in violation of its policies. In my time on the Board this was done a couple times a year so as not to delay things like construction projects that needed to get started as quickly as possible owing to our short construction season in Duluth. With the Red Plan there will be many such suspensions. But, a suspension of the rules to authorize the District’s health insurance premium sight unseen? Impossible! Its too big. There was no excuse to pass it without a discussion or information. In the old days my old buddy, Tim Grover, would have raised hell about the suspension of the rules for the construction contracts even little piddly ones. He would have gone ballistic over a rush job on the health insurance that went forward without a timely measured discussion. Sadly, that Tim Grover is long gone. In order to expedite business, all pertinent information relative to the items on the agenda shall be made available to the School Board in written form for their study prior to the meeting. Administrators and other qualified persons may be required by the Superintendent or members of the School Board to present information at the meetings. It shall be the intent of the School Board to be fully informed before making decisions. The School Board doesn’t run the schools. That’s why they have an Administration. But they are the community’s eyes and provide oversight or at least ought to. Here’s item 5 on their official list of duties. 5. Approving the budget, financial reports, audits, major expenditures, payment of obligations, and policies whereby the administration may formulate procedures, regulations and other guides for the orderly accomplishment of business. You see the School Board’s duties as spelled out in the School District’s Policies only requires the board to approve financial things. There is no requirement that the Board understand what they are doing or bother about trivial details like whether a health insurance plan’s premiums jump by $2 million dollars. For our School Board its not really about suspending the rules. Its more about suspending belief! This is the perfect School Board to oversee the Red Plan. Its a classic case of the blind leading the blind. At the recent special meeting of the Duluth School Board Dr. Dixon told the Board that Governor Pawlenty never said what we said he had said. What Pawlenty never said was that Duluth voters should be able to vote on the Red Plan and that he would support legislation to accomplish this. I have a vision of Dr. Dixon jambing his fingers in his ears and shouting “I can’t hear you” over and over . Mimi Larsen, who along with Paul Goosens grilled me at the Chamber Debate, is passing out information on the levy. This story in the last Budgeteer is about as close as you will get to finding out how the levy funds would be spent. In fact, there is no telling how the funds will be spent. Someone at the Chamber debate suggested that telling the public how the money would be used would help pass the levy. Nancy Nilsen explained that because the Board was facing only cuts unless the highest tier of the levy passed, at $1200/pupil, the School Board didn’t want to be seen as using threats to pass the levy. One person who got through to Mimi was told to ask the District how it would use the levy money. 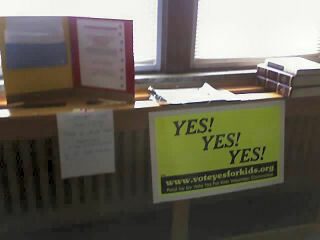 In other words, Vote Yes For Kids is almost as informative as the Mimi’s other group Move Forward Duluth. Once again Nancy Nilsen asserted that there would be no new taxes generated to pay for the Red Plan. She corrected Gary first a month ago then she corrected me at the Chamber Debate. The District was originally planning to let additional bonds in 2011 but is now racing to sell them next year before a new school board scuttles the Red Plan. The bonds will be for the last third of the $293 million project. Most reasoning people would think that borrowing $90 million dollars would require a School District to levy taxes to pay it off with the interest. Nancy simply says this won’t happen. She says that our District will save $125 million dollars by implementing the Red Plan so, of course, all that savings will pay the bond off. Cross her heart it will. There is one sure way to pay off the bonds without raising taxes to pay them off. Raise taxes for the operating levies and pay them off. You could just claim that the loan is being paid off with savings. What savings? how about savings from not having school on January; or savings from only driving kids to school four days a week; or savings from sticking a couple extra kids in each class; or savings from laying off a slug of teachers. Just call me a cynic. Maybe a sip of Nancy’s Kool Aid will fix that. The Nation’s financial panic threatens the last third of the Red Plan’s bonding. Hardly any investors are buying bonds from any governments. That was the gist of this story in the Trib’s Sunday Paper. Despite present bond market instabilities, Duluth school district officials remain optimistic conditions won’t have much affect on the cost of implementing their “red plan” – a long-range initiative to consolidate and renovate several schools. Two-thirds of the bonds for the $293 million project already have been sold, with the remaining third slated for sale in the next six months. That flexible time window should save the district from being hit by bad market conditions, according to Mike David, account executive for Johnson Controls, the consulting firm heading up implementation of the red plan. The district is planning for a 5 percent interest rate on the final bond installment. If the market starts pushing that number up, David said it could be worrisome. “Seven percent or something would obviously be higher than what we are expecting, but it’s difficult to say when it would really start to cause a problem,” David said. The district received lower-than-expected interest rates on earlier bond sales, providing some wiggle room. If anything, David said, the district is hoping the economic hard times will prove beneficial for the red plan. “The fact that other projects across the country will be shelved as a result of this, we will hopefully end up with better pricing when we bid our projects because it will essentially decrease demand,” he said. One thing you can always count on from JCI is an upbeat attitude. Their kind of jaunty like Paul Newman in Cool Hand Luke when he was lopping off the tops of all those parking meters. It must be the sound of all that loose change. While the following information is not meant to minimize the pain a failed operational levy would inflict on Duluth its worth noting how much per student our neighboring school districts voters have authorized. Remember, at present Duluth taxpayers pay additional property taxes to the tune of $365/pupil. This overblown story in the Trib, whose publisher is leading a desperate charge to push the Red Plan, was a hoot. If we held a “vote” at one of our Let Duluth Vote meetings I’ll bet we could announce some pretty dramatic results. The Chamber of Commerce is surveying their entire online membership today – perhaps a thousand voters instead of 40. It will be interesting to see if the results are as favorable and it will be interesting to see if the Tribune bothers to mention the results if they demonstrate less support for the levy. The group’s “Plan B” was still only two pages long, as posted on its Web site. 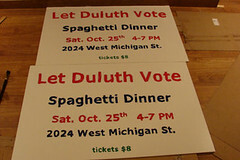 In recent weeks, Let Duluth Vote planned a spaghetti dinner and launched a symbolic recall petition. Its leader, Harry Welty, found time to post nearly 60 blog entries, appear on a radio show and write columns for the Reader. This was time well spent? As a member of a different grassroots group, moveforward-duluth.com, I am frustrated there’s no real “Plan B” to consider as an alternative to the red plan. Everyone has heard about this alternative since winter. Where are the details to prove “Plan B” would be better for my two children – for all of Duluth’s children? The current long-range facilities plan was approved by the state Department of Education. “Plan B” has to be more than two pages to survive. The Department of Education demands details, not spaghetti. After having its lawyers spend six weeks pouring over our petition and then wrongly claiming it wasn’t legal before forwarding it to the Attorney General who told us she didn’t care what the District’s lawyers said (The Legal fees probably cost another teacher a job) . . .and then sitting on the favorable reply for another week in an obvious attempt to keep Plan B off the November ballot. . . followed by proclamations that our smaller plan would cost more than the Red Plan. . . followed by dismissive comments that the School Board could ignore the vote anyway. . . followed by increasingly desperate attempts to get hold of our Plan B in what looks to us like a thinly disguised attempt to further sabotage it. . . Let Duluth Vote is working with its own experts on a plan that will pass muster with the Minnesota Dept. of Education. It will be more than two pages long not that this matters all that much judging by what we heard at the recent community meeting at Ordean. The architects in charge of drafting a plan for the new Ordean High School explained that the entire JCI Ordean plans presented to the Dept of Education had been scrapped. They were starting from scratch. So much for JCI’s expertise. Vic, sent me a link to this story yesterday and chided me about my not commenting on it. I had to email back and explain that I’ve been very busy and had a growing backlog of posts to make. Here’s my reaction. These board members are silly. They were told by one of the $50,000 consultants they hired (That cost some poor teacher a job) that they have the power to remove Gary from the School Board so they are a little full of themselves. You wouldn’t know (They apparently don’t) that Gary has a constitutional right to have his own opinion. Of course, constitutional rights are just one of a long list of things that these School Board members don’t know a lot about like: education finance, conflicts of interest, sensible bidding processes, and anything about how much more important teachers are to a good education than pretty school buildings. I defy the School District’s lawyers to read Justice Douglas’s entire opinion without shaking in their boots. I just turned on KDAL talk radio because I’d heard Corinda Horton, one of the hosts, had hoped to hear from me about the Red Plan. She was engaged in a discussion of groups who have been reportedly registering ineligible voters like Acorn. When I heard her say that she wanted callers who could tell us about organizations that were trying to steal our votes I had to call her right away. She laughed when I mentioned the Duluth School Board. She invited me to come in and chat more about the Red Plan at some future date. A couple months ago a former legislator told me he disagreed with me on the Red Plan. Later I overheard him tell another person that the people in Duluth were just experiencing sticker shock implying that the cost was reasonable. Today he told me that he’d come to the conclusion that he had been wrong. He was agonizing about the possible failure of the operations levy with its much advertised hideous cuts. Then he told me a story he had just heard about JCI. Apparently a decade ago the Marshall School asked JCI to evaluate its school with a view to sprucing it up. JCI told them that they needed to tear down the school and build it again. They hired another consultant and eventually spent $100,000 to improve Marshall. Its funny what folks won’t spend their own money on when they can’t tax other people to get it. I doubt if many Marshall parents will be voting Yes, Yes, Yes. My latest Reader Column. I don’t yet know if it will be in Friday’s Reader.